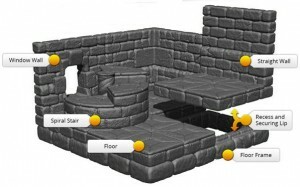 The creator of True Dungeon and former president of Dwarven Forge has a new terrain idea to set miniatures gamers drooling. UpWorks is a modular system for building castles in three dimensions—that is, building up multiple levels with modular components. A full castle set, however, requires backing at $590. Curved towers are an extra $90 each. Not modular but just as drool-worthy is the castle project from Miniature Building Authority. Buildings and wall sections come complete and highly-detailed with furnished interiors, working drawbridges, removable roofs, slide-out floors, and other features. Various buildings are available separately but the incredible large castle setup requires a $2,600 pledge. The gangster-themed card game, Gang Up!, has players recruiting each other as partners in the commission of crimes. Influence cards, however, allow other players to affect crimes in progress. Partners too, may turn on those who recruited them. Frankly, the project hooked me with the big-band music playing in the video. 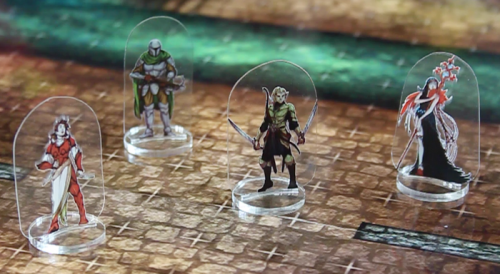 Arknight’s Flat Plastic Miniatures look to be a nice step up from paper minis. Printed on thin sheets of clear plastic and pre-cut, these will have a transparent background and be more durable. A $75 pledge gets at least 186 figures plus bases (more with stretch goals), so about 40¢ each. Nord is a game about competition among Viking settlements. Players get three meeples a turn to claim the resources of forest, mountain, and ocean spaces, or to attack and occupy neighboring settlements. The board reflects an island but is made of tiles that can be configured differently each game. The first non-RPG project from Triple Ace Games, Rocket Race is a slightly comical steampunk space-race card game. The basic rules have players bidding cogs on rocket component and event cards. Using the advanced rules, players will have to manage resources in three scientific disciplines to purchase components.